The Zafarnāma (Punjabi: ਜ਼ਫ਼ਰਨਾਮਾ, Persian: ظفرنامہ‎, lit. 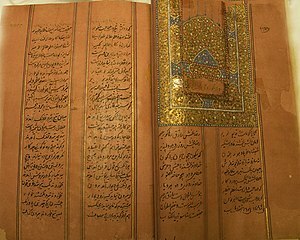 Epistle of Victory) was a spiritual victory letter sent by Guru Gobind Singh Ji in 1705 to the Mughal Emperor of India, Aurangzeb after the Battle of Chamkaur. The letter is written in Persian verse. Guru Gobind Singh Ji sent Bhai Daya Singh to Ahmednagar to give it to Aurangzeb. However it is said that a copy of the Zafarnama, written by himself, was found with the Mahant of Patna Sahib in 1890 and one Babu Jagan Nath made a copy; this copy was somehow misplaced by him. Since Babu Jagan Nath was himself a scholar in Persian language, he could reproduce it from his memory and got it printed in Nagri Parcharni Patrika in Benaras. He is also believed to have sent a copy to Sardar Umrao Singh Shergill in Amritsar who is said to have given it to Khalsa college and which in turn reproduced in Makhz-e-Twarikh Sikhan. In Punjab newspapers, it first appeared in the Khalsa Samachar of 16 July 1942. Then in 1944, Kapur Singh ICS published it in Urdu Ajit of Lahore under the heading "Fatehnama". It is quite possible that in the process of translations and publications of the Zafarnama at different stages, some verses were not reproduced correctly and what we have today is not the original Zafarnama of the Guru in its entirety. The abrupt end of the Zafarnama also indicates that it is not complete and that some verses have been left out. Objections raised by some scholars on the authenticity of a few verses may be viewed in this context. In this letter, Guru Gobind Singh Ji reminds Aurangzeb how he and his henchmen had broken their oaths sworn upon the Qur'an. He also states that in spite of his several sufferings, he had won a moral victory over the Emperor who had broken all his vows. Despite sending a huge army to capture or kill the Guru Ji, the Mughal forces did not succeed in their mission. In the 111 verses of this notice, Guru Gobind Singh Ji rebukes Aurangzeb for his weaknesses as a human being and for excesses as a leader. Guru Gobind Singh also confirms his confidence and his unflinching faith in the Almighty even after suffering extreme personal loss of his Father, Mother, and all four of his sons to Aurangzeb's tyranny. Guru Gobind Singh Ji invited Aurangzeb to meet him in Kangar village near Bathinda (Punjab) and said no need to worry as Brar tribe will not harm him (Aurangzeb) as they are under his command. " On the way, there will be no danger to your life, For, the whole tribe of Brars accepts my command. (59)"
Of the 111 verses, the maximum numbers of 34 verses are to praise God; 32 deal with Aurangzeb’s invitation for the Guru Ji to meet him and the Guru's refusal to meet the Emperor – instead the Guru asks Aurangzeb to visit him; 24 verses detail the events in the Battle of Chamkaur, which took place on 22 December 1704; 15 verses reprove Aurangzeb for breaking promise given by him and by his agents to the Guru; In verses 78 and 79, Guru Gobind Singh Ji had also warned Aurangzeb about the resolve of the Khalsa not to rest till his evil empire is destroyed; 6 verses praise Aurangzeb. Guru Gobind Singh Ji wrote this letter from the village of Dina in Malwa region of the Punjab. Guru Gobind Singh spent few days at Dina and then moved to Dod, Kotkapura, Dhilwan Kalan, Jaitu, Shri Muktsar Sahib, Lakhi Jangal, and Damdama Sahib. Guru Gobind Singh's Ji last fight with Mughal Army happened at Khidrane Di Dhaab now called Sri Muktsar Sahib. Halal ast burdan bi-shamsher dast. It is then right to fight"
^ Guru Gobind Singh: Prophet of peace. ISBN 9380213646. ^ Singh, Guru Gobind (2011). Zafarnama. Translated by Sarna, Navtej. New Delhi, India: Penguin Books India. p. 23. ISBN 9780670085569. This page was last edited on 21 March 2019, at 16:21 (UTC).